Sergei Eisenstein. Photo public domain. What better way to enjoy Northern Spark’s White Night than seeing Russian avant-garde movies on the Post Office wall! 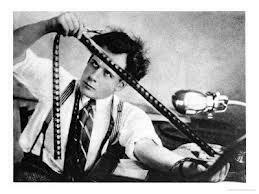 Early Russian directors were leaders in film theory – pioneers in montage and visual imagery. Due to shortages and general chaos of the civil war that followed the Russian Revolution, the state produced short propaganda films that traveled about the vast nation on trains, and were exhibited wherever a blank wall existed. The feature films that followed were influenced by these agitki (short for agitkino, or agitation cinema). We preserve the spirit of the agitki by projecting films along the rough exterior of the Post Office. Support The Museum of Russian Art and Northern Lights in their goals of energetic engagement through the arts. The Extraordinary Adventures of Mr. West in the Land of the Bolsheviks (1924) – a satirical take on a westerner’s visit to the new Soviet Russia. Battleship Potemkin (1925) – Director Sergei Eisenstein’s famous depiction of mutiny in the Imperial Russian Navy set during the failed 1905 revolution. The End of St. Petersburg (1927) – An account of the October Revolution and the storming of the Winter Palace by director Vsevolod Pudovkin. Old and New (1929) – The director’s trademark theories of montage applied to the collectivization of agriculture. Earth (1930) – Alexander Dovzhenko’s poetic ode to Ukrainian farmers. ¡Que Viva México! – Intoxicating images Eisenstein shot in Mexico in 1930 for a never-completed film.